← Crane Bucket Hoppers For Sale Factory Direct Guarantees Lowest Price! Crane Dump Box are designed and load rated for overhead lifting in industrial applications. Avnix’s crane dump box containers are manufactured for job sites that are limited to crane accessibility. Crane trash boxes are built to be lifted with a crane and transport debris & waste materials from multi story buildings into a rectangular tear off container. Dump Box could could be used to lift construction materials from the ground floor to the top of a building with a crane. 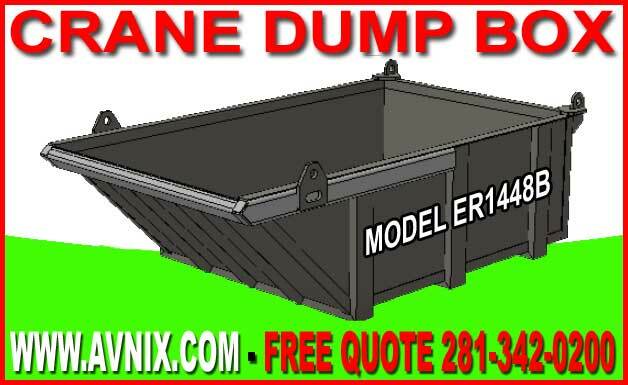 Our heavy duty crane dump box has a large capacity to hold most any kind of trash or bulk material. Waste box is designed to be lifted with a set of 10-foot or longer cable or strap slings, and a sloped end makes it safe and easy to release loads. To dump the waste skip, the two forward slings are disconnected from the lifting eyes with the lifting line slack. The hopper is then lifted with the rear slings still attached, dumps the load from the sloped end. The skip pan is ideal for removing “roof trash” or other construction refuse from roofs and elevated decks. Dump boxes are constructed of heavy steel and reinforced at all stress points to ensure durability.